This tomato confit is what summer is all about. If I was more on top of it I would have been making this luxurious condiment all summer long. Not only is it simple to prepare but the slow and low roasting temperature in the oven brings out the sweetness in the tomatoes and garlic. You’ll find yourself smearing this on toast, pizza, grilled meat, or stirred into pasta. And don’t get me started on how flavorful the infused oil is after roasting. You’ll be tasting it by the spoonful! This recipe is a great way to use up the abundance of the tomato harvest and is a crowd pleasure to boot. I’m not sure why I haven’t thought to prepare my tomatoes like this until now but better late than never! I hope you all enjoy this simple recipe as much as we do. Cheers to the summer harvest! 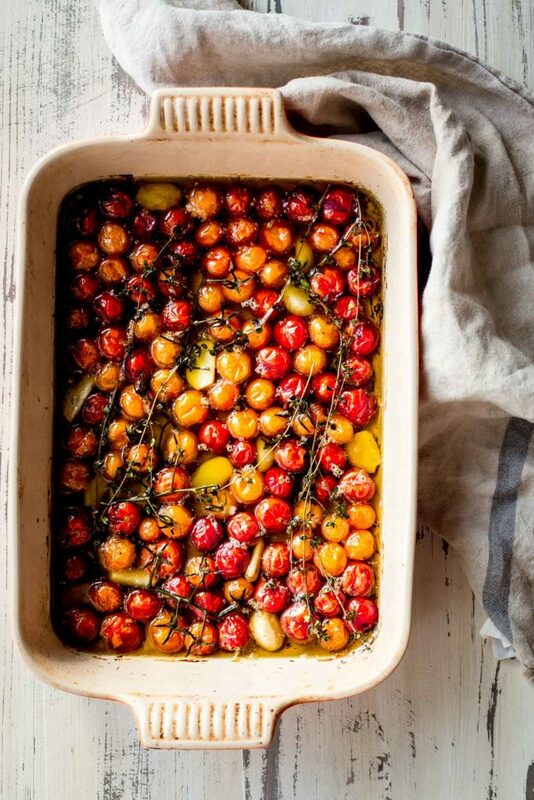 Place the tomatoes in a single layer in a baking dish and drizzle them with the oil. Add thyme, garlic and salt. Bake until the tomatoes are swollen and the skins are wrinkled. About 2.5-3 hours. When the tomatoes have cooled completely store them in an airtight container for up to 2 weeks, completely covered with the reserved cooking oil to prevent air from reaching them. Hoping you, your farm and family are safe from the locale fires. As a long time reader and happy owner of your cookbook I’m so worried for all in the region. Both of my 20 something boys are in the agriculture industry in that area, organic wine production and organic farming. We appreciate how hard you work and hope you are out of harms way. Superb way to use cherry tomatos !! I made this and it is to die for delicious. I grilled a crusty baguette and then smeared with goat cheese. Topped with the tomatoes. Fabulous! I have the tomatoes in the oven now. Just reread the directions, what reserved oil do you speak of? I drizzled all the oil on the tomatoes. The oil you cook the tomatoes in. I hope that’s clear. Enjoy the confit! Simmering away in the oven as I type. I’m wondering on any long term preservation ideas. Any experience in canning or freezing the confit? As a side note, I have loved each and every recipe I have made from Dishing up the Dirt. Best book ever! How long do these typically stay good for? Do I refrigerate?